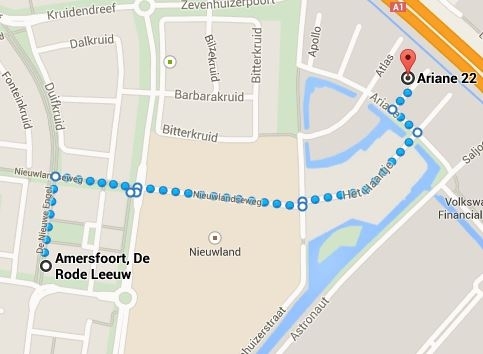 Take exit 13, turn right at the traffic light and follow Rondweg Noord in the direction of McDonalds. Follow description 3. Rondweg Noord. Take exit 13, turn left at the traffic light, direction Calveen. At the next traffic light, turn left into Rondweg Noord, direction McDonalds. Follow description 3. Rondweg Noord. After about 200m on Rondweg Noord, turn right at the 1st traffic light into Ruimtevaart (McDonalds is on this corner.) Follow Ruimtevaart for approx. 750m and at the end of the road turn right, then immediately left into Ariane. Take the second street on the right (still Ariane). We are situated on the ground floor of De Lokeend building. Ample free parking available in front of our door.